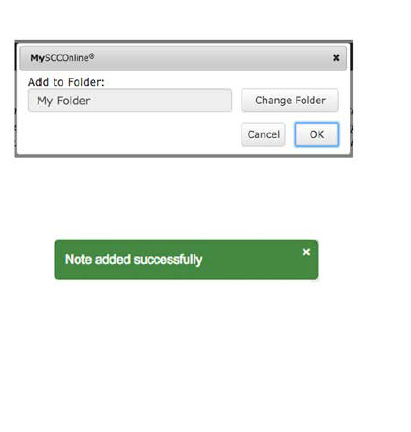 MySCCOnline If you find documents that are of interest, you can add them to your own special "folder"
To do this, please turn your attention towards this new button in the document column of the results window. On clicking this button, you will get the popup below, where you can select the folder where you wish to save the document. For now, save the document to the default folder (called “My Folder”) and click on “OK” to continue. The document will now be added to “My Folder” and you will receive a confirmation on the bottom right of your screen. 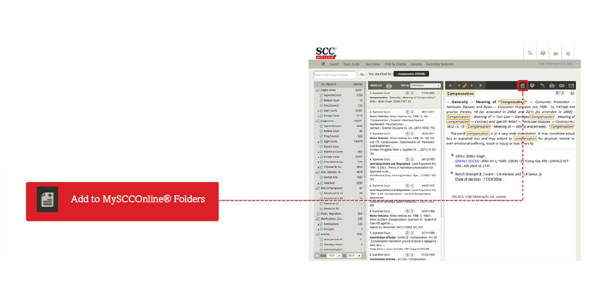 As you continue with your research, and you keep coming across documents which you find useful, keep adding them to your folder by clicking on the “Add to MySCCOnline® Folders” button above.